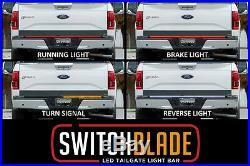 Blade - LED Tailgate Light Bar. Brilliant and defining LED light output in red, amber and white. Custom designed to fit all full-size trucks. Fully encapsulated in a tinted polycarbonate housing. IP69K - Fully sealed for water and weatherproofing. Includes 4-prong wiring harness for easy hookup to receiver hitch. Includes patented attachment clips for easy removal to access spare tire release. Operates with running lights, brake lights, reverse light and turn signals! 2015+ Ford F150 with backup camera/sensors will require part# 8726F (wire harness) to complete the installation. The item "Putco 92009-60 SwitchBlade LED Tailgate Light Bar Fits All Full Size Truck NEW" is in sale since Wednesday, August 17, 2016. This item is in the category "eBay Motors\Parts & Accessories\Car & Truck Parts\Lighting & Lamps\Light Bars". The seller is "todaysports" and is located in United States,. This item can be shipped to United States, Canada, United Kingdom, Denmark, Romania, Slovakia, Bulgaria, Czech republic, Finland, Hungary, Latvia, Lithuania, Malta, Estonia, Australia, Greece, Portugal, Cyprus, Slovenia, Japan, China, Sweden, South Korea, Indonesia, Taiwan, South africa, Thailand, Belgium, France, Hong Kong, Ireland, Netherlands, Poland, Spain, Italy, Germany, Austria, Bahamas, Mexico, New Zealand, Philippines, Singapore, Switzerland, Norway, Saudi arabia, Ukraine, United arab emirates, Qatar, Kuwait, Bahrain, Croatia, Malaysia, Brazil, Chile, Colombia, Costa rica, Dominican republic, Panama, Trinidad and tobago, Guatemala, El salvador, Honduras, Jamaica, Antigua and barbuda, Aruba, Belize, Dominica, Grenada, Saint kitts and nevis, Saint lucia, Montserrat, Turks and caicos islands, Barbados, Bangladesh, Bermuda, Brunei darussalam, Bolivia, Ecuador, Egypt, French guiana, Guernsey, Gibraltar, Guadeloupe, Iceland, Jersey, Jordan, Cambodia, Cayman islands, Liechtenstein, Sri lanka, Luxembourg, Monaco, Macao, Martinique, Maldives, Nicaragua, Oman, Peru, Pakistan, Paraguay, Reunion, Viet nam, Israel, Uruguay.